Almost as soon as Pluto’s moon Charon came into view, we had a question: what’s that big red splotch on top of it? Now, we finally have an answer. A new paper out in Nature looks at data from NASA’s New Horizons mission to Pluto to come up with a solution to the mystery. 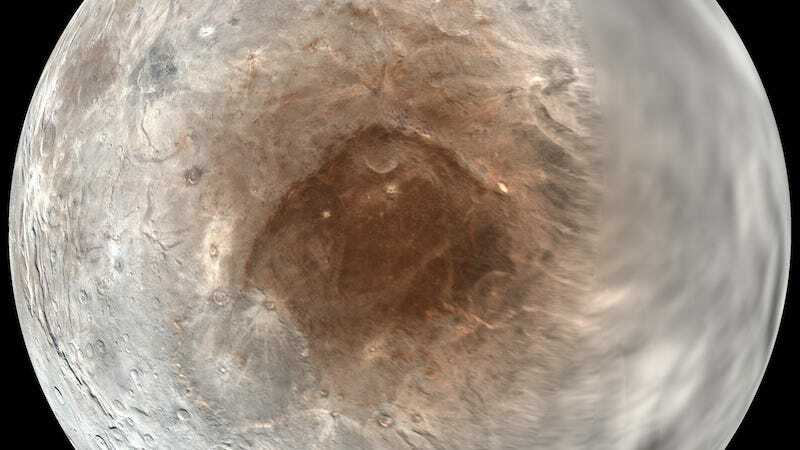 It turns out that, although the color is on Charon, it’s really methane from Pluto that’s turning Charon red. When methane escapes from Pluto, some of that gas gets caught in the atmosphere of its near moon, Charon. Because of Charon’s long orbit, its poles alternate between century-long periods of nonstop sun and nonstop dark. “It gets cold on earth here on Earth when it’s dark for 10 hours. There, it stays dark for a century at a time,” Will Grundy, a co-investigator for NASA’s Horizons mission who works out of Lowell Observatory in Arizona noted to Gizmodo. This extreme cold freezes the methane gas until the sunny season arrives again. When things begin to thaw, the byproducts of the methane gas leave behind a reddish residue, which slowly accumulates into the rusty patch we see now. The finding does more than just explain a strange patch of color, though. It also shows that Pluto and its moon Charon have an usually close relationship—one that could change how we think of lunar behavior. “We’re not really used to planets doing things to their moons beyond pulling on them. This is two worlds that are sharing an atmosphere in a way, which is a sort of alien setting,” said Grundy. The next step is to look for more systems like this, to figure out just how unusual Pluto and Charon really are.